Many people dream of building a beautiful, environmentally friendly home. But until now there has been no systematic guide to help potential builders work through the complete process of imagining, planning, designing, and building their ideal, sustainable home. 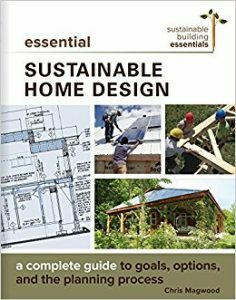 Essential Sustainable Home Design walks potential homebuilders through the process starting with key concepts, principles, and a project vision that will guide the house to completion. Creating a strong, integrated design team and working with professionals and code officials to keep the project on track from start to finish. Primer on building logistics, material sourcing, and protocols to ensure that the initial vision for the project comes to fruition. One-page summaries and ratings of popular sustainable building materials and system options. Ideal for owner-builders and sustainable building contractors working with clients aiming to design and build a sustainable home. Chris Magwood has designed and built some of the most innovative, sustainable buildings in North America, including the first off-grid, straw bale home in Ontario. He is co-founder and director the Endeavour Centre for Innovative Building and Living and co-editor of the Sustainable Building Essentials series. Chris is the author of Essential Prefab Straw Bale Construction, Essential Hempcrete Construction, Straw Bale Details, More Straw Bale Building, and Making Better Buildings.